Discussion in 'Performance Lighting' started by mechanic021, December 9, 2004. What guage wire should I use to connect up the relays? the fog lights are 12 volts of course and are only like 55 watts. thanks for the help! In case your wondering why so many relays, my trucks factory switch is a pulsed switch so i have to convert the pulsed signal to a constant one via the relays. My truck didnt come with factory fog lights so im adding them and all that crap runs through the BCM in gm trucks so i had to bypass all that junk . This link gives you the info on how to size wire. http://catalog.com/susq/other/wiring.htm Usually 14 guage will work fine. I dont understand what or why the need for the relays. i have a 98 blazer that didnt come with fog lights from the factory. Well its just not as easy as adding the factory fog light equipment. The fog lights and every other electrical part for that matter is controlled by the BCM body control module. when you push the fog light switch it sends a signal to the bcm telling it to activate the foglight relay. The factory fog light switch is a momentary switch that only sends power when it is pushed or held down. So you have bypass the BCM wiring and wire in the 5 relay pack in place of the factory relays so you can turn the momentary switch signal to a constant signal to leave the fog lights on. Without the relays the fog lights will not work unless you hold the button down. Why use the BCM at all? 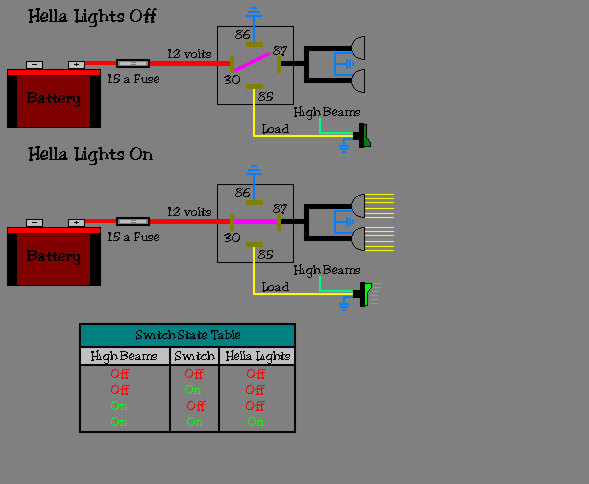 I would remove the switch from the BCM and wire it directly into a single relay for the lights. Or replace the switch as in the diagram below. IMO 5 relays are way to many and lesson the reliability of the circuit. It would be a PITA to troubleshoot a relay failure (or multiple relay failure). And as Bill has already stated a 14 gauge wire will be fine. You will need at least one relay, to power the fog lights. But the trigger for that relay can be simple, as just stated above. I don't know what the other three would be for, but it should only take one to capture the odd signal from the BCM. One experience of mine: I installed an 88 Mustang 302 into a 1985 Crown Vic P71(351 carbureted). Everything was right, but the starter power signal wasn't enough to power the ignition. I had voltage, but not enough. For a temporary solution, I found a relay which was triggered by that starter signal. I powered the cranking ignition circuit with that. The setup will work, but the more complexity you introduce the harder it will be to troubleshoot should a problem arise. As for keeping everything factory I am assuming you mean factor "look" as I don't believe the factory used 5 relays to actuate fog lights. your right i just mean by factory look. 5 relays for fog lights???? Let's all say it together-"Overkill"